How will you overcome objections to name badges? How will you staff the creation, distribution and collecting of name tags? How will you make it easy for members to get them? How will you help visitors fill them out? Will you try it for a year? 6 months? or make it permanent? Where will name tags be created? Who will create them? Where will people get their name tag? Techniques won’t help you grow a church, but name tags may be one way to help make your congregation members approachable. Relational warmth is necessary to grow a church – name tags or not. Do name tags fit your church culture? You as a church leader likely know the culture of your area. Your task will be to help them see the value of name tags in helping people connect one to another and what it means to your guests. What type of name tag? Name tags come in different styles and shapes. One church has a button maker and they make clip on buttons. I’m still amazed that pin-ons are still available. I don’t like having my shirt poked. I don’t like accidentally stabbing myself. If it’s a humid environment, I don’t want a potential rust stain on my shirt. I still visit small churches that don’t have air conditioning. The style you choose to use will be dependent on your budget and tolerance for upkeep and maintenance. Some churches that choose the plastic engraved one sell them to their members who want one so that it’s not part of the church budget. If you started a name tag work in your church, why did you choose to do so? Discuss with us that we may learn — use the comment field below. Thanks for adding those thoughts. Your observations get into knowing your local church culture. If a church is discussing the idea, I as the outsider would push the question back — how do you know that? This gets it out of the area of speculation. Many years ago we had the pin-on name tags. Our pastor emeritus thought this practice was very important to be able to greet people by their name. The collection process was not tedious, but it was less than successful. We had alphabetized boards that held the name tags in the narthex, where people would pick up their tags when they came in and put them back before they left. Except that many people, including me, walked out with the name tag and took it home. Hopefully, they remembered sometime on the way home and left it in the car. But too often, it got all the way home, and we had to print out a new one. We finally did away with the practice until recently. We decided to try it again with the stick-on tags. That’s fine for one day, but what do you do to make it easier and faster for the regulars? Any advice would be appreciated. You’ve encountered the chief problem with nametags for churches. They get lost and it requires maintenance. . . There is no easier and faster. . just stop by and write your name and put the badge on. . .
You members will need to catch the vision of why. Without the hospitality vision, this nametag thing becomes a chore. I’ve recently attended one that used the peel on / stick on kind. . . as a user I had no problem putting it on. It didn’t have that super sticky glue that leaves a residue. Everyone had the same nametag. . . There wasn’t a visitor name tag vs a member name tag to make me stand out. It was quick and easy to put it on as the table was well supplied with plenty of name tags and markers and a trash can for the peeled paper. I didn’t have to separate name tags from a bunch. I didn’t have to locate markers. I didn’t have to find a waste basket. They made the experience as smooth and painless as possible. Thank you, Chris. You’re comments are well taken. I had just decided to do printed clip-on tags for regulars and the stick-ons for everyone else and for those who left their tags at home. But then you said that the stick-ons make everyone feel equal–visitors don’t stand out and regulars don’t look “special.” Also, you are absolutely correct re: what our vision as a congregation should be. Hospitality is so important to newcomers and visitors, and unifority in name tags might help them ease in. But it also helps everyone in getting to know others, perhaps even long-time members of the congregation that you don’t normally “hang” with. I have seen almost as many cliques in churches as I have in schools! Seeing someone’s name, even when they’ve attended your church for years and you still don’t really know them, helps you to put a name with that face and make them more knowable. In addition, people with terrible name recall, such as myself, hesitate before approaching someone whose name you can’t remember. Easily being able to read their name eliminates the awkwardness and encourages making new friendships. Thank you very much for your reply–it was very helpful and timely. I lean towards not making visitors stick out by having a different name tag. I think that is more of a personal preference rather than a hard and fast rule. 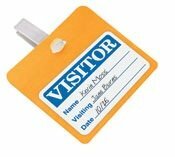 If all have the same name tag, the goal of friendliness can still be facilitated, rather than making the visitors potentially stand out with a different one. I just taught a week long class and I wish students had name tags or name tents at their tables. That would have helped me. . .